Category: For Ryan: Lego, Cake & Music! Today I bring you final in the Lego! Cake! Music! series in memory of my brother Ryan. I can’t thank my blogging mates enough for all these super awesome blog posts, and their amazing support over the past few weeks. They are dead set legends. I was devastated when I heard the news that Kylie’s brother had passed away. I am so very close to my own brother, he’s the one that began calling me Danya Banya when I was still knee-high to a grasshopper, and is still one of my closest friends. I can’t imagine what Kylie and her family are going through right now, and I wanted to do something to help. I was supervising the kids in the bath when I saw Kylie’s email come through asking if any of her blogging friends would like to submit a guest post for her blog while she is in mourning. She mentioned that her brother had liked Lego, so something to do with Lego would be fitting. And then I knew what we could do to help. We could paint. So I towelled down the kids, and brought them downstairs for a rare spot of after bath painting. But we didn’t use brushes, we were going to paint with Lego instead. JJ always jumps at the opportunity to do familiar things with unfamiliar materials, and this was no exception. 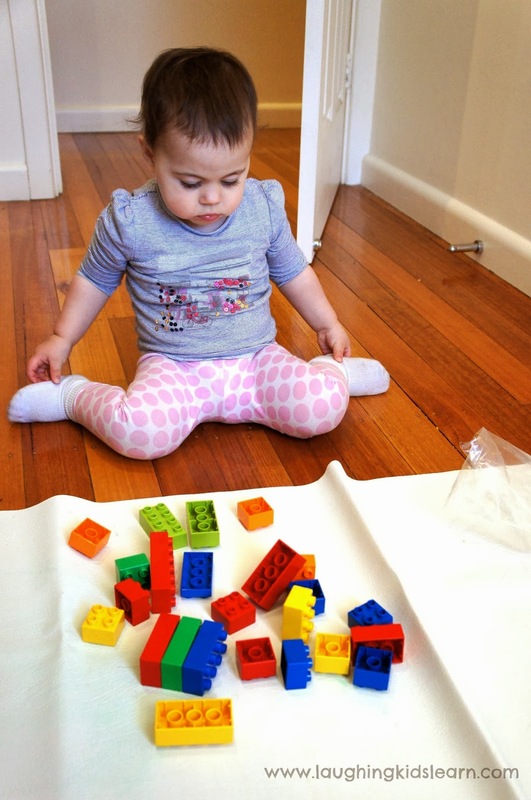 She picked up one of the Lego pieces, and started stamping straight away. I encouraged her to try stamping with all the different sides – the bottom, the top, and the side. We noticed that some of the Lego pieces were different shapes, and thus made different patterns. Before long she asked for one of her Lego people to paint with. Sure! She tried dipping the Lego man, but then elected to finger paint him first, before attempting to paint with him. He wasn’t as effective at creating an imprint as the other Lego pieces. JJ used a bit of trial and error to see what works best. After a while, Bee came over to see what all the fuss was about. She’s started showing an interest in creating art with our textas lately, but I hadn’t given her a chance to play with the paints just yet. It seemed that this was the opportunity! And then, with the wonder that only a brand new toddler can muster, she discovered something amazing. The sensation of squeezing, squelching, oozing finger paint between her fingers. All the while this exploration was happening, I was trying futilely to keep as much paint out of her mouth as possible. We were using non-toxic finger paint, but it still isn’t ideal for her to eat it. Here’s a photographic timeline of my success (or lack thereof). As this was a process-orientated art experience, the end result wasn’t the goal. But nevertheless, here is our finished work of art hanging on our fence to dry. Perhaps we’ll use it as Christmas wrapping paper? And to dear Kylie, my heart goes out to you. Words can’t express how sorry I am for your loss. Danya Banya is a blog about Danya, an Australian Mum doing her best to raise two daughters and learning along the way. It’s a place to share how we play, create, laugh and love. 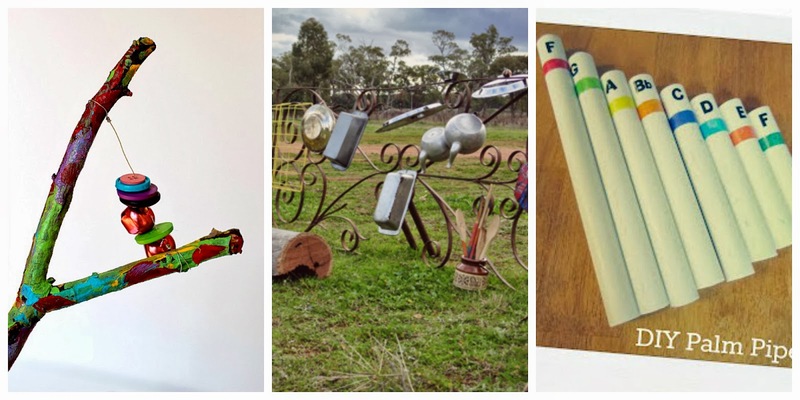 In honour of my brother Ryan, I welcome Debs from Learn with Play at Home and her post about music for kids. Music really is magical. It has a way of touching us to our core and making us feel certain things. It can ignite a power and strength within us, make our hearts soar or crush our soul in an instant. The power that music holds is something not to be talked about but to be experienced and I feel that a life with music is a richer life indeed. It is almost an automatic thing in young children that when they hear a tune or an upbeat melody, their body wants to react and move with the music. 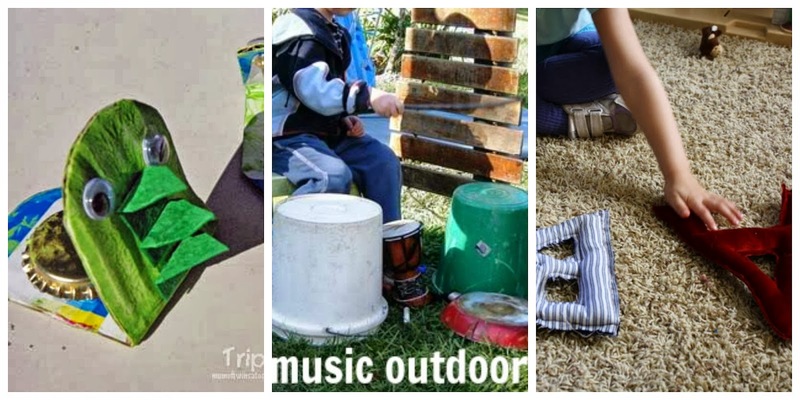 There are so many fabulous ways that you can involve music in your children’s life that all bring different areas of learning, skills and experiences together. 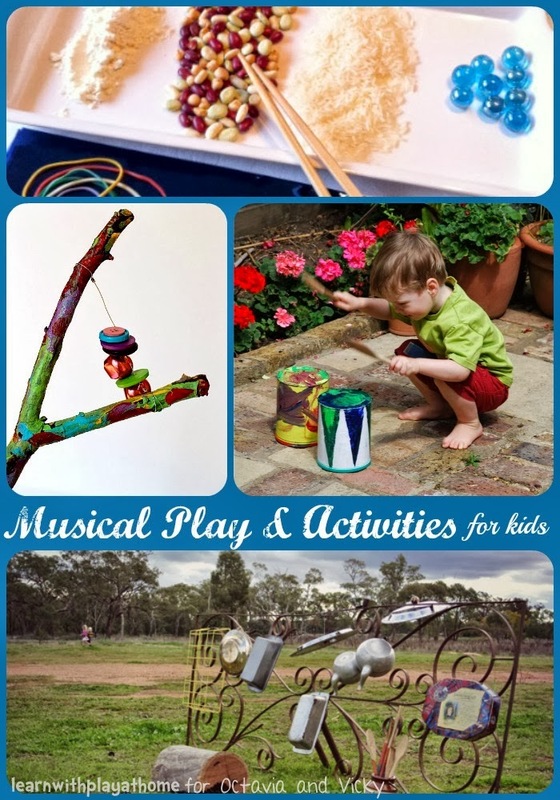 Below are a collection of gorgeous ideas, activities and crafts that you can try to bring a bit more music and magic to your child’s life. Debs is a Primary School Teacher on family leave with her 2 young children. She is passionate about Early Childhood Education and believes firmly in the importance of learning through play. 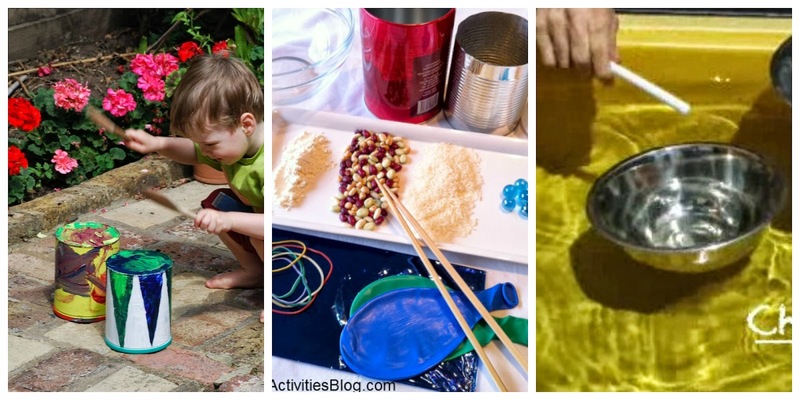 She is the author and creator of LearnwithPlayatHome.com which is a resource full of activities and ideas with handy tips on how to further promote learning with play. Above all, she believes that learning should be fun. You can also find Debs on facebook, pinterest, twitter, instagram and google+. 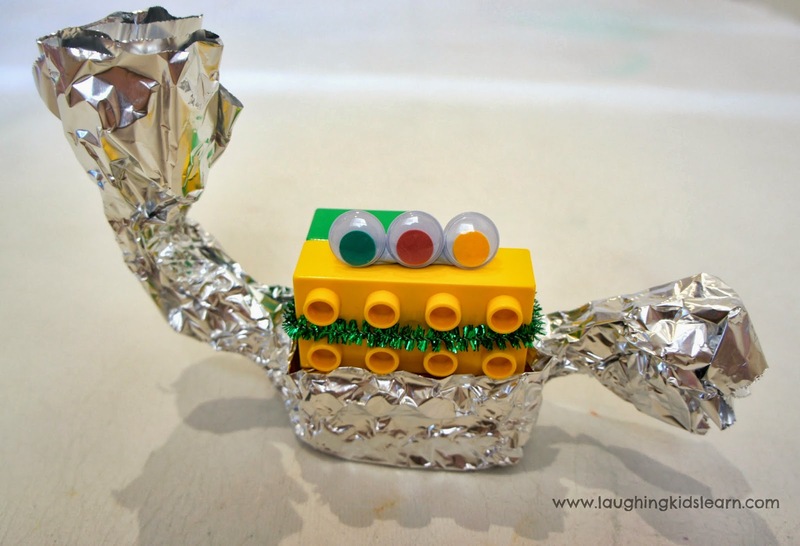 In honour of my brother Ryan, I welcome Kate from Laughing Kids Learn and her lego monsters. Hello! My name is Kate and I blog over at ‘Laughing Kids Learn‘. It gives me great pleasure to share this idea with everyone at ‘Octavia and Vicky’. When I was young I owned a big metal tub of Lego. It was my favourite play item and it was always a common sight to have the pieces scattered over my bedroom floor. I’m sure many parents have seen a similar sight. Having a little one of my own I have enjoyed introducing her to Lego. 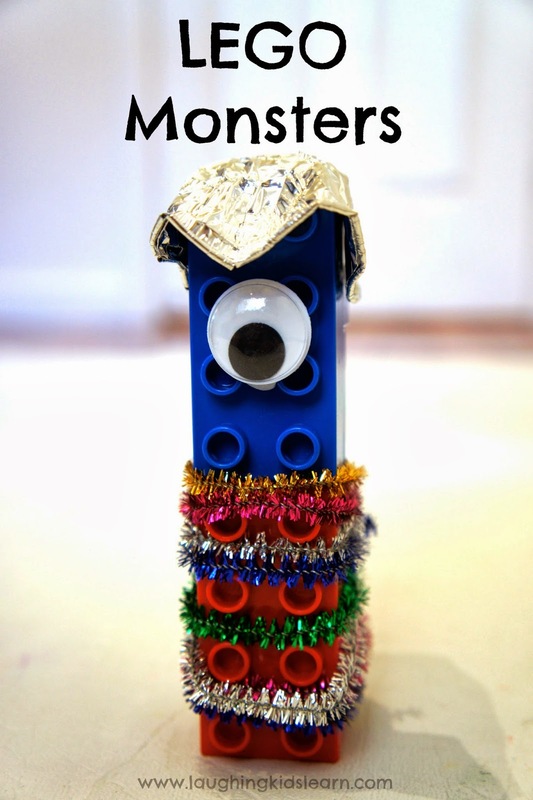 We often build together but today I decided we would try something different, decorating Lego to create fun monsters! 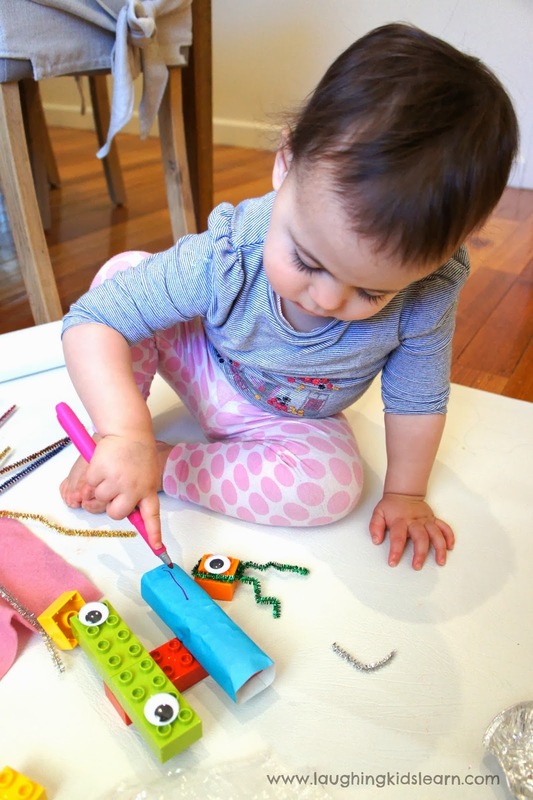 Before making our Lego monsters my little girl ‘Possum’ (22 months) had to consider how we would construct our monsters so they would be different in shapes but also be able to stand up independently. This would be a great challenge for slightly older children to problem solve. My little girl, ‘Possum’ (22 months) seems to really take on this activity one the eyes were in place. 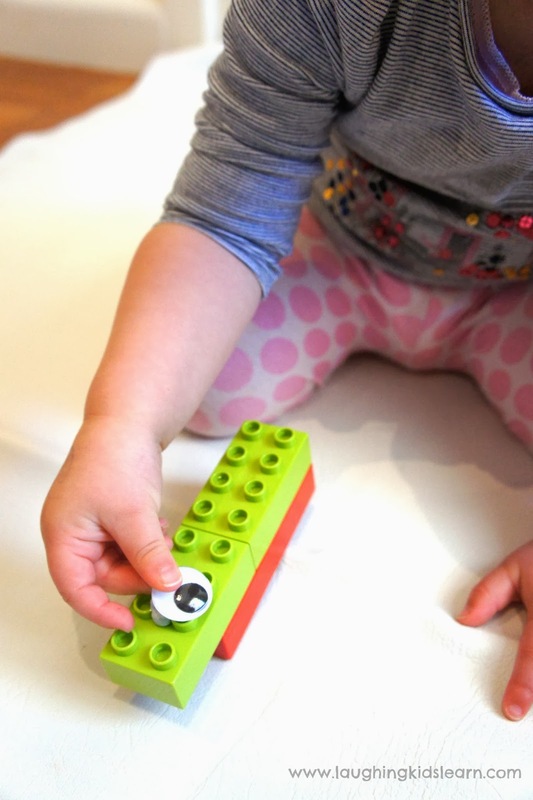 She added a few more pieces of Lego and laid out a piece of felt for it’s bed. 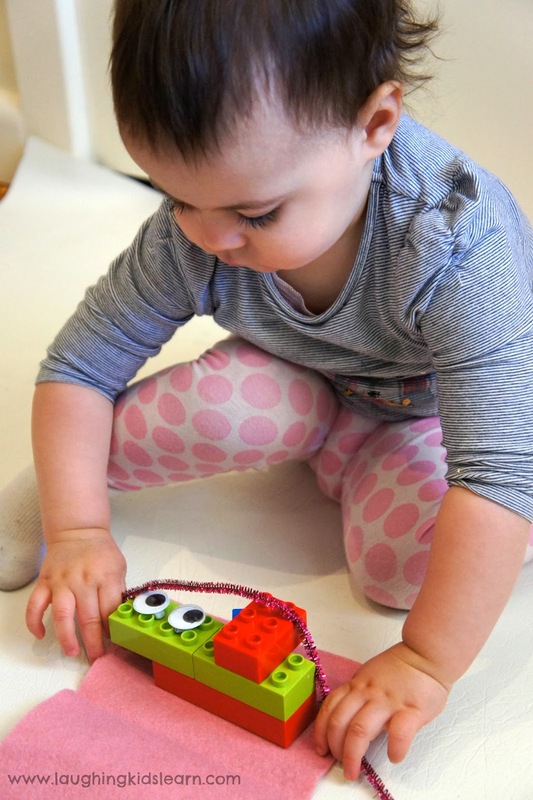 Some of the other materials, such as the pipe cleaners, she found a little challenging to manipulate, however, older children may not have this difficulty. I experimented with rolling paper around the Lego pieces and holding it in place simply using the pressure in the attachment. I loved that this gave Possum an opportunity to draw on the paper, adding more character to her monster. Here we had a go at using tin foil! This was a wonderful material that could easily be shaped however way was desired. 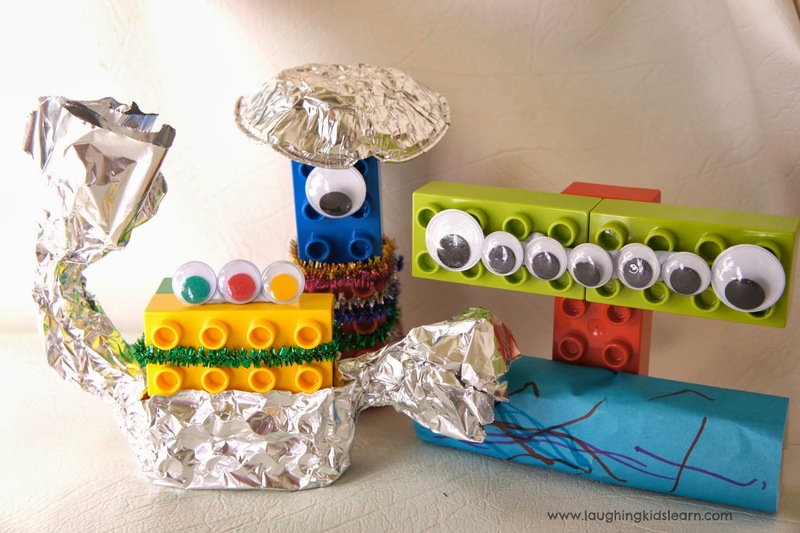 The above Lego man had tin foil arms, which would be great fun in pretend play. Here are some of the great characters we made together. It was lots of fun and an activity that Possum has asked to do a number of times since her first experience. I hope you and your children enjoy this activity as much as we did.